Reflexology is the study of feet pressure points in Chinese medicine. These points are believed to cure ailments and diseases. Feet have numerous pressure points that are powerful in regulating or maintaining good health. 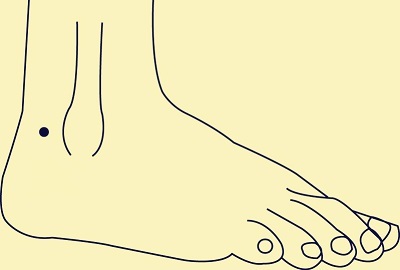 According to the theory, every part of the body is connected to one of the pressure points on feet. Location: This pressure point can be located by pressing your finger in the indented spot between your big and second toe. When you are close to the point where the tendons meet, it is located where it is sorest when pressure is applied. Uses: Stress, anger, headaches, irritability, anxiety and menstrual pain. 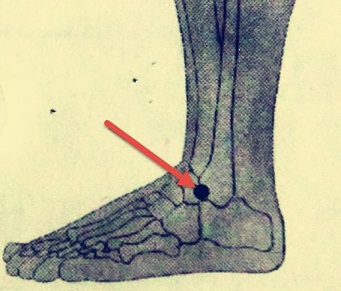 Location: There is a depression below the joint of the big toe which can be located by pressing along your foot. 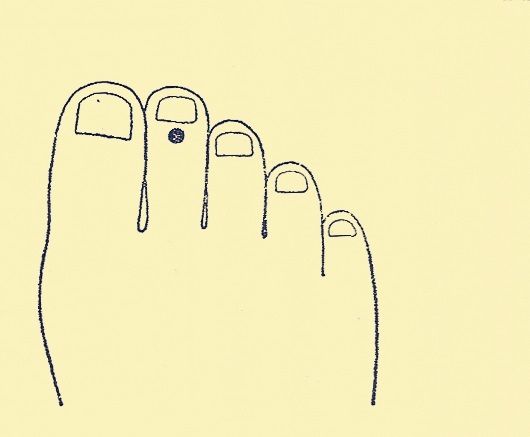 Located between your second and big toe, you will find it where the pressure can be most felt. Uses: Palpitations, insomnia, poor memory, anxiety, night sweats and hot flashes. 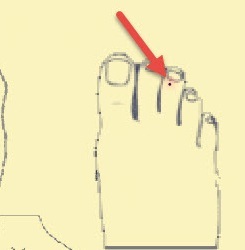 Location: This point can be found on the inner side of your big toe about one inch from the corner of your toenail. Uses: Dizziness, hernias and stomachaches. 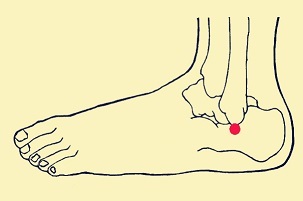 Location: On the middle side and near the ball of your foot, you can find this pressure point. It can be found by pressing along the side until your reach a depression and where the pressure is felt the strongest. Uses: Abdominal distension, stomachaches, diarrhea, dysentery and vomiting. Location: One of the many pressure points on feet, it can be found in the indention between the Achilles' tendon and the top of the medial malleolus (inner bony bump) of your ankle. Uses: Kidney disease, sore throat, bronchitis, toothaches, asthma and arthritis. 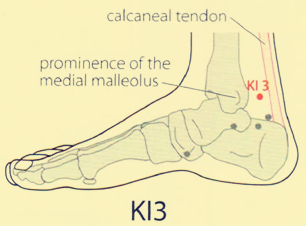 Location: The point can be found on the lateral malleolus, the bony bump on the outside of your ankle. Uses: Colds, improve patience, and reduce anxiety and fear. Location: Located about an inch below the lateral malleolus, it is below the bony bump on the outside of your ankle. Uses: Mood stabilization, mental stress and coping skills. Location: This pressure point can be found in the indention between the highest point of the lateral malleolus and the Achilles' tendon. Uses: Lumbar pain, headache, eye diseases, high blood pressure, diarrhea and intestinal issues. Location: This point is located in the thick part of the web of skin between your first and second toe. It can be found by applying pressure and is where it is felt the strongest. Uses: Eye diseases, liver disease, leg cramps and sinusitis. 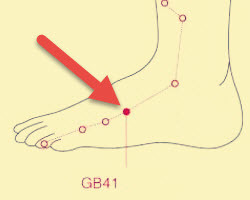 Location: Located between your 2nd and 3rd toes on the plantar or underside of the foot, it can be easily located due to the soreness felt when pressure applied to this point. Uses: Press this point to relieve food poisoning and urinary tract infections. 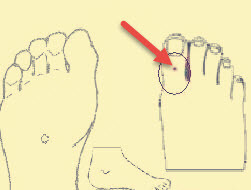 Location: This pressure point in found about an inch below the adjoining web of the big and 2nd toe on the upper side of the foot. Location: This point can be found along the exterior side of your foot by pressing and running your finger along the area until you are about a third of the way down. Uses: Muscle cramps, apoplexy, lumbar pain, psychoneurosis, and eye conditions. Location: Located in the center point of your big toe, it is on the upper side on the middle joint. 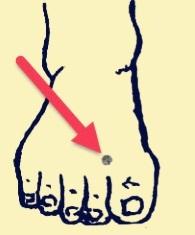 Location: This is another of the pressure points on feet that is located in the toe area. It can be found on the upper side of your second toe, just below your toenail. Location: This point is found right below the toenail of your middle toe. Reflexologists follow the wisdom that if you apply the right amount of pressure to certain points on your hands, feet or ears, you can affect different areas of a person's body. They believe that specific points affect different parts and functions of the body, as well as several different ailments. For example in reflexology, if pressure is applied to specific pressure points on feet that are directly connected to your stomach, if done right, it can relieve nausea. Reflexologist do not claim to diagnose health issues or cure disorders, but rather to work together with other treatments to help alieve ailments. Millions of individuals use reflexology to help them combat health concerns such as but not limited to bladder function, anxiety, diabetes, headaches, nausea, asthma, heart conditions, and menopause. 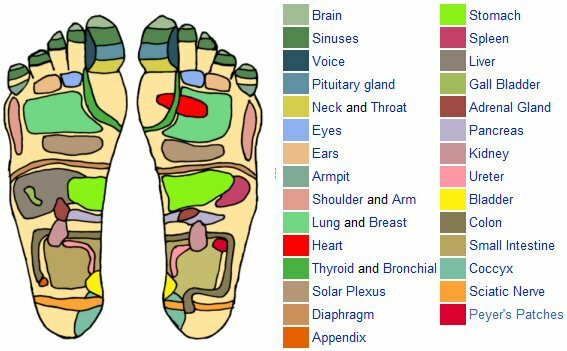 This reflexology chart has areas color coded, with each one corresponding with different parts or organs of the body. The right foot is connected to the body parts on that side of the body and the left with the left side of the body. For example, the heart is on the left side of the body so the corresponding pressure points will be on the left foot. Both considered reflex therapies, acupressure and reflexology use pressure on specific points on one area of the body to positively affect several different areas of the body. Reflexology is more orderly, using an arrangement that is reflexive of the human body and are located on the hands, feet and ears. 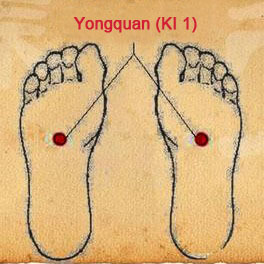 However, acupressure outlines the body with long energy lines and utilizes over 800 reflex points. Often people mix up massage with reflexology. While both of them use the power of touch, they differ greatly in practice and approach. Massage works from the outside of the body, working inward through manipulation of the soft tissue covering the body. This is done by utilizing techniques like stroking, tapping, kneading and friction. The goal is to relax muscles and relieve the tension which is triggering the different ailments. A client typically removes most of their clothing during a massage therapy session. Reflexology differs because it concentrates on pressure points on feet, hands and ears, with each one specifically affecting specific parts and functions of the body. 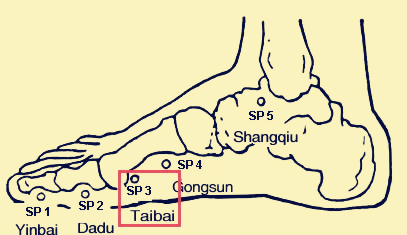 Instead of broad techniques, a reflexologist uses micro movements to concentrate on precise areas. During a reflexology session, a client only needs to remove their shoes and socks. How Long After Eating Can I Exercise?